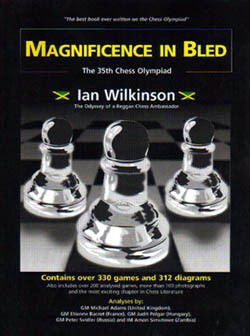 Historic Moments: “Magnificence in Bled: The 35th Chess Olympiad"
For the past two years "chess don" Ian Wilkinson has not only served the Jamaica Chess Federation (JCF) as its president, but has worked feverishly on completing his book, "Magnificence In Bled: The 35th Chess Olympiad." Chess has never been a popular sport in Jamaica but it has had some significance, especially during the cold war years. That period featured the unforgettable battles between American and Russian grandmasters, like the American Bobby Fischer who single-handedly wrested the world title from the Russian Boris Spassky. The battle for the World Chess Championship has witnessed numerous titanic struggles engaging the interest of not only the chess enthusiasts but also the public at large. In chess circles, the chessboard is considered the ultimate mental battleground and the world champions' supreme intellectual gladiators. But, with the passage of the cold war period and the Fischer/Spassky duels, the game has lost much of its appeal to the wider public. For example, Garry Kasparov is universally acclaimed as the greatest chessplayer ever and, although he is still alive and ranked number one, very little is known about him in local sports circles. Wilkinson is determined to change all that and remove chess from the backburner to a game of national appeal in Jamaica. A lawyer by profession, he also lectures at the Norman Manley Law School at the University of the West Indies, Mona. He only learnt to play the game five years ago after purchasing a set for a little boy and feeling compelled to learn it so that he could answer the boy's questions. In his bid to learn the game rather quickly and catch up with his age group, Wilkinson read anything he could lay his hands on. This led to not only a tremendous love for analysis of the game, but the development of respect and admiration for the institution of chess, its practitioners and visionaries. He played his first tournament in 2000 but, by 2002, he was the non-playing captain of the Jamaican team to the 35th Olympiad and coach of the women's team. He was elected president of the Jamaica Chess Federation, in 2003 and later that year was awarded the JCF's inaugural chess journalist of the year award for his reporting on the Bled Olympiad. Ian Wilkinson on the floor of the FIDE General Assembly at the 36th Olympiad in Mallorca, Spain. Apart from his work as president of the JCF, Wilkinson spent nine months on this book which has been described as a "bold, historic and landmark effort" by a Jamaican chess aficionado reflecting his experiences at the 35th Chess Olympiad in Bled, Slovenia in 2002. 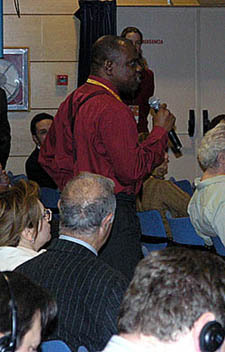 According to Dr Daaim Shabazz, creator and webmaster of the internationally acclaimed chess website, The Chess Drum, which is followed by chess players in over 150 countries, "What makes Wilkinson's work more enriching is not only the classic games from chess legends of the past, but the inclusion of long-forgotten and often omitted nations such as those of Africa, the Caribbean, Latin America and the Pacific." Dr Shabazz noted that these regions would not normally see the light of day in the annals of chess history, though making contributions that often go unnoticed. He added while covering the 2002 Olympiad from his home, he received photos and/or reports from Wilkinson. The electric atmosphere painted by the photos and reports depicted a "magical atmosphere". So when Wilkinson returned to Jamaica, he asked him to write a story about his experiences in Bled. Wilkinson penned an essay titled, "Jamaica's Fantastic Sojourn at The Chess Olympiad", which became a very popular page on the website. The success of this project, obviously, led to Wilkinson's decision to write this book. According to the author, "I love to write and I absolutely love chess." He said that his initial plan was to concentrate solely on the games played at the Olympiad by the Jamaican teams in order to help the Jamaican players learn from their mistakes and improve their chess. But, he had vowed to seek a way to put Jamaica on the international chess map and, eventually, decided to expand his original idea to highlight games from as many players as possible. "The project took on a life of its own and grew more and more each day. When I thought that I had finished a chapter, more ideas would come or a new tournament would be staged and I almost always wanted to add another game or two to update an analysis. I was driven by an unseen force to write, write, write and my ambition and hunger to complete the project increased each day," he explained. The result is a book which provides a very personal account of the Bled Olympiad involving 330 games, 210 of which have been analysed, including 56 played by the Jamaican men's team and 42 played by the women. The games are analysed by him using some of the latest and most respected chess programmes including Fritz, Deep Junior and Shredder. A lot of attention has been paid to women's chess. Wilkinson's handsome book has gotten rave reviews. One of the highlights of the book is that it gives details, or results, of the individual world championship clashes. He also provides, where possible, information on the countries of origin, year of birth and year of death of many famous players. In addition to the index of openings and the index of players, an index of nations is also included and involves over 700 players from 132 countries. I am sure that as this game becomes more and more a measure of intellectual achievement, more Jamaicans are going to want to ensure that their children learn at least the basics of chess. In that context, this is probably the best way to get them interested - a very Jamaican look at how the game is played, analysed and recorded. Balford Henry, "A Jamaica take on Chess," The Jamaican Observer (BOOKSHELF), 21 November 2004. 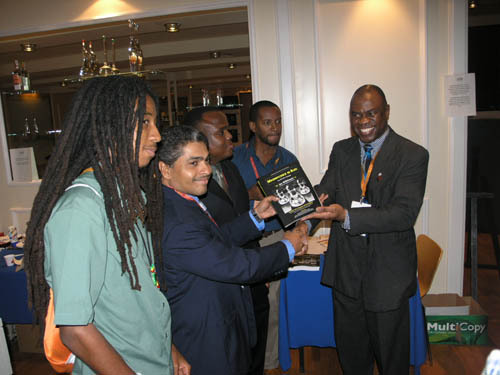 Wilkinson presents a copy to the Jamaican National Team.